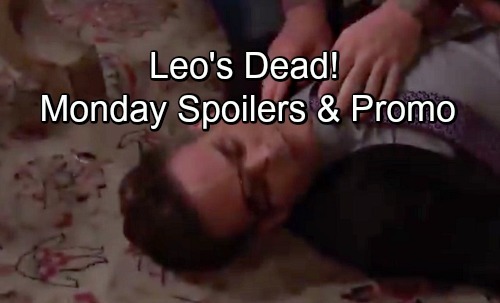 Days of Our Lives (DOOL) spoilers for Monday, July 2, tease that Sonny (Freddie Smith) will fume over Leo’s (Greg Rikaart) proposal. He’ll lash out and suggest it’s never going to happen. Sonny wants rid of his Titan troubles, but this isn’t the way to pull that off. He can’t stand Leo, so he could never handle being married to him. Leo will keep up his efforts to persuade Sonny, but Will’s (Chandler Massey) going to barge in pretty soon. Thanks to John (Drake Hogestyn), he’ll have shocking info on Leo’s past. Days of Our Lives spoilers say plenty of dirty details will come out. Leo’s history of prostitution will be a big part of this heated confrontation. He has a serious criminal record and “Leo” isn’t even his real name. Once Will threatens exposure, Leo will blow his top. Days of Our Lives spoilers say he’ll wrap his hands around Will’s neck and try to strangle him. Sonny will break things up and hurl Leo across the room, but the situation will take a dark turn. After Leo hits his head, he’ll be killed instantly! Meanwhile, DOOL fans can watch Gabi (Camila Banus) and Abigail (Marci Miller) do some scheming. They’ll plan to secure the necessary DNA samples and set up a paternity test. Days spoilers state that Gabi will sneak in the DiMera mansion and grab what she needs. She’ll get Stefan’s (Tyler Christopher) sample and catch a glimpse of a faceoff before she heads out. Gabi will spot Stefan and Kate (Lauren Koslow) sparring, so she’ll grow quite curious. This isn’t a lot to go on, but she might do a little more digging and work a new angle. Helping Kate would mean hurting Stefan and that’s definitely something Gabi would be on board with. Maybe Kate and Gabi can team up on a Stefan takedown plot. Whatever the case, Stefan had better be ready for trouble. Days of Our Lives spoilers hint that his world will be rocked in more ways than one, so stay tuned for all the drama. We’ll give you updates as other Days news comes in. Stick with DOOL and don’t forget to check CDL often for the latest Days of Our Lives spoilers, updates and news.